Alexander Polyakov was born on the 21 July 1983 in Orsha city of Vitebsk region. First musical education got at the Music School of the city of Orsha. In 1995 he entered to the Republican College of Music of the Belarusian State Academy of Music in Minsk (class of I.Bartoshevitch). From 2003 to 2008 he studied at the Belarusian State Academy of Music in the class of Honored Artist of the Republic of Belarus, professor Y. Gildiuk. In 2010 he graduated from the magistracy of the Belarusian State Academy of Music. He took part in various master classes with prominent musicians: D. Bashkirov (Russia), P. Donohoe (UK), M. d'Alberto (France), S. Markarov (France), E. Tavastierna (Finland) B. Mishchuk (Russia), A. Ponochevniy (Belarus). 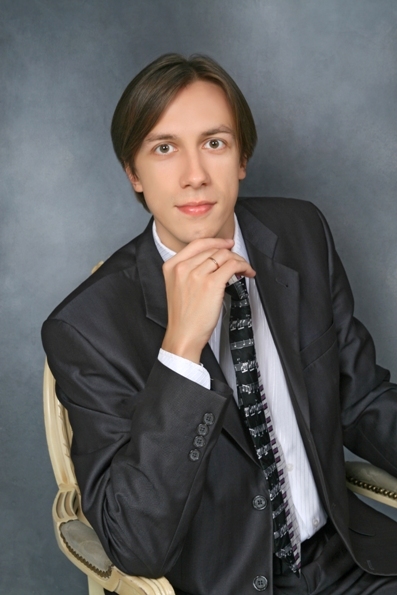 Since 2008 he is the soloist of the Belarusian State Philharmonic Society. Throughout the creative life he has performed with the State Academic Symphony Orchestra of the Republic of Belarus and the Symphony Orchestra of Belteleradiocompany, with the Chamber Orchestra of Brest regional Philharmonic and the ensemble of soloists "Partita". He has worked with such conductors as: A.Anisimov A. Razumov, A. Lesun, V. Volich, V. Prilepin, V.Sobolev (Russia), P. Destro (Italy). Concerts of the artist were held in the cities of Belarus, Russia, Poland, France, Italy, Germany, Spain, Austria, Finland. He has participated in prestigious international festivals: Festival of Arts (Gomel, Belarus), the International Festival "Musical Autumn", "Minsk Spring" (Minsk, Belarus), "R. Schumann and his friends "(Solingen, Germany), Days of Culture of Minsk in Moscow," Dialogs "(Festival of Contemporary Music, Minsk)," Extra Piano Festival "(France)," Sounds of Lempaalla "(Finland), the International Festival of Arts named after A. Vangrovts (Poland) and others. The winner of the junior competitions. He was awarded with a gold medal and I prize at the First International Delphic Games of Art (Bryansk, Russia), II prize and the title of laureate at the International Piano Competition (Togliatti, Russia). He is a scholar of the Special Fund of the President of the Republic of Belarus on support of talented youth. He participates in the international cultural and consular projects, collaborating with the Polish Institute in Minsk. The works of the artist has been praised with musician media in Belarus and abroad (Ukraine, Russia, Estonia, France, Spain). Along with the concert activity he has been a musician and lecturer. Since 2010 he is a teacher of children's music school №10 named after E. Glebov, and since 2014 he is professor of special piano department of the Republican College of Music of Belarusian State Academy of Music. Also he is a permanent member of the jury of junior competitions of piano music: "Music drops", "Musical sparks", "Competition of piano music named after M. Grushvitsky. " Alexander Polyakov – is one of the brightest and most talented artists of Belarus. A musician in his years has an extensive repertoire, manifesting himself most clearly in the works of the Romantic era. His works are characterized with the originality and persuasiveness of the interpretation, the ability to clearly and logically build shape combines in him with high technical performance. I.S.Bach: Prelude and Fugue (WTC I and II); Partita c-minor; Italian concert. I.Haydn: Sonatas e-minor, F-major, G-major, E-flat major. W.A.Mozart: Sonatas a-minor, B-flat major, c-minor; Fantasia c-minor; Concerto № 20 d-minor. L.van Beethoven: Sonatas №7 D-major, №11 B-flat major, №23 f-minor, №25 G-major; Rondo-Capriccio G-major; Concerto C-major. R.Schumann: Carnavale op.9; Romance F-sharp major; Toccata op.7; "Forest scenes" op.82. F.Chopin: Etudes op.12 №1-12, op.25 №1, 6, 7, 9, 10, 11; Scherzos №1, 2, 3, 4; Sonata №2 b-flat minor; Ballade №2 F-major; Polonaise op. 44 f-sharp minor, op. 53 A-flat major; Waltz op.34 #1, op. 64 # 2; Nocturnes. Sonata h-minor; Concerto № 1. M.Mussorgsky Pictures at an Exhibition. P.Tchaikovsky: "Dumka", "Seasons of a year; Concerto № 1 b-flat minor . I.Stravinsky: Three movements from "Petrouchka". S.Prokofiev: Sonata № 7 B-major. G.Gershwin-A.Polyakov: Rhapsody in blue (arranged for solo piano).